…cause I certainly don’t. Someone sent me this link for “nada bike”. The entire site seems to consist of just some psuedo-individuality/anti-establishment slogans and some hyperlinks, half of which lead to desperate online resumes and the other half are dead links. Worst. Site. Ever. 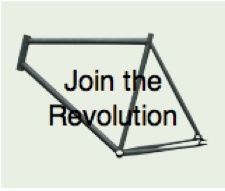 After the Hot Topic call to revolutionary glory, they urge you to join the cause by buying a fixed gear frame for $100 plus $49 shipping. I don’t know what to make of this. Are they serious, or is this some joke by creative would-be professionals who, for lack of employment, have too much time on their hands? WTF? Before you do that, you can join my club! Send me $100 and I’ll send you something out of my closet. It’ll be like eBay, only afterwards you’ll be Mark V’s BFF.